I spent most of my childhood in Hamadan, a cold, windy city in the mountains southwest of Tehran. I was the youngest member of my family, growing up among adults in the 60s and 70s, and there was nothing for kids to do on cold afternoons except stay home. While my mother worked away at her household tasks we used to listen to the radio together – it was her one distraction from her hard work. At 2PM Radio Iran broadcast a programme called Golha, Flowers, dedicated to traditional Iranian music. We never missed it. Among the many singers featured on the programme, one stood out. The moving, velvety voice of Elahe accompanied all my early memories ; my mother whispering the lyrics as she listened, occasionally jotting them down on scraps of paper or in the margins of the newspaper. Elahe was born Bahar Gholam-Hosseini in 1934 in the ancient city of Yazd, central Iran. At the age of seven she was already singing secretly in her room when her father was not at home. By the time she was twelve, she had realized that her next-door neighbour was the Iranian composer, Majid Vafadar. Listening to the sound of music and singing coming from the Vafadar’s place was one of the joys of her day. She decided to ask Majid to help her become a singer in any way he could. When Elahe’s father got wind of his daughter’s musical ambitions, he put his foot down firmly. No daughter of his was going to have a career as a singer. When she was twenty she once again clashed with her parents. Against her will, her parents insisted that she marry Yaghoob Yeghane just as she was about to get her diploma from Bozorgmehr High School in 1954. But to her relief, her new husband promised her he would not stand in the way of her future singing career. A few years later, Majid Vafadar gave Elahe the helping hand she had asked for. Judging that her voice had suitably matured, he introduced her to a film director (Mohammed Ali Jafari) who was making a film entitled “The Man Who Suffers” (1959). Elahe was chosen to sing two songs for the soundtrack – one of which, “Laughter, Laughter,” became a big hit. This was the first official broadcast of her voice – at that time she was using the stage name Parichehr Face of an Angel. For the next two years Elahe attended the Ark Music Conservatory in Tehran studying musical notation with Gholam Hossein Banan, a famous Iranian traditional musician and singer. She also studied Dastgāh and Radif with Abdullah Davami, the great master of Radif in Persian music. The traditional music of Iran is based on the Radif which is a collection of old melodies that have been handed down by masters to their students through the generations by oral tradition. Over time, each master’s own interpretation has shaped and added new melodies to this collection, which may bear the master’s name. Radif organizes the melodies in a number of different tonal spaces called Dastgāh. Traditional Persian music consists of twelve principal dastgāhs; in spite of there being 50 or more extant dastgāhs, theorists generally refer to a set of twelve principal ones. A dastgāh is a melody type that a performer uses as the basis of an improvised piece. The Radif of Iranian Music was inscribed in UNESCO’s Intangible Cultural Heritage list in 2009. At the age of 27 her voice attracted the attention of Davood Pirnia, the producer of the Golha programme on Radio Iran. Following a successful audition, she joined the programme that she was to feature in for the next fifteen years, changing her stage name from Parichehr to Elahe Goddess. The first song she performed on Golha was “Disreputable Me” about a woman who loved her sweetheart too passionately (with lyrics by Bahadur Yeghane and music by Homayoun Khorram, who composed many of her songs.) Her career really began then, with the radio show. One of her most famous performances was of the traditional song, “From the Blood of our Youth, Tulips Bloom” based on a poem by the revolutionary poet Aref Qazvini, with music arranged by Ruhollah Khaleghi. The poem was written at the time of the Constitutional Revolution (1905-1911) which established a parliament in Persia during the Qajar dynasty. 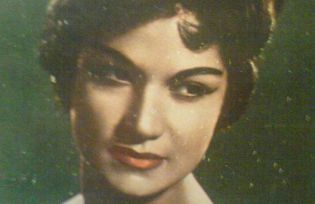 Later Elahe also included pop songs in her repertoire, but she was mainly famous as a classical and traditional singer. The song “He´s Gone” (about a faithless lover) is one of her most enduring traditional-pop songs. Her songs touched a chord with all her listeners – she sang of migration, heartbreak, the beauty of nature, springtime, youth, rivals in love, friendship, loneliness, farewells and disappointments. Over the years she worked with many poets and composers including Pervez Yahaghi, performing in more than one hundred famous episodes of Golha on Radio Iran. But after the revolution in Iran (January 1978-February 1979), when Golha was taken off the air and women were barred from singing, Elahe left the country and joined her children in London. For a time there was no market for Iranian musical instruments – even carrying an instrument was a crime for years. Concerts and music performances were transferred from public to private spaces. Composers had no clients and as the number of opportunities to perform dwindled, most singers went into voluntary exile, moving to somewhere they could feel alive, as they did not feel alive without being able to sing. Many left heart-broken and ended their journey far from home, some had to abandon traditional music and take up singing pop-songs in restaurants to make a living, others remained silent and many tried to continue their careers, but it was not the same – several of them returned but there was nothing for them but a pit of oblivion. When Elahe travelled to the UK, she left all her documents and belongings at home, not thinking that the she would be away for long. However as the situation evolved back in Iran and after hearing advice from her friends and colleagues, she decided to delay her return home for a while. She eventually emigrated to the USA and settled in California. Temporary travel became decades-long exile. She gave concerts from time to time while she was abroad, however there was not much interest in Iranian traditional music outside Iran, and she only managed to release one album entitled “Cupbearer”. The lack of producers and opportunities to perform induced some singers to join forces with the political opposition groups to organise concerts. Elahe was vehemently opposed to mixing art and politics – however one year she did agree to take part in a concert for the Iranian Nowruz New Year celebrations organized by an opposition group which was generally despised back home in Iran. She agreed on the condition that only Iranian flags be flown during the concert and that she would only sing a few classical songs. However the group’s flags were unfurled during the concert and her name became linked with theirs. They used her name unscrupulously to promote their cause. Elahe’s name was blackened in Iran as a result. Despite her eventual wholehearted rejection of the group and their politics, she was unable to rid herself of the stigma. In fact Elahe’s career in the Iranian music scene spanned nearly 50 years, her voice remaining strong and expressive till the end. Despite the ban on women singing, people still listened to her songs in private. Elahe was not forgotten. Elahe performing “The Sound of Loneliness” by Fereydoun Shahbazian. After living through a difficult period, personally and professionally, Elahe was diagnosed with liver cancer. When it was found that the cancer was incurable, she decided to return to Iran. No-one knew she was coming. Perhaps not even the immigration officials noticed the arrival of the singer, because she was not Elahe anymore. Cancer had switched her off. Shortly after her return in 2007, Elahe passed away in the Parsian Hospital in Tehran. Her sister commented: “You would think that someone like her would become a fish and return to the sea, become a bird and fly away or a flower that blooms, a red rose for example. But we buried her in silence, in a deep hole in the ground, and we threw soil on her in silence”. The world owes a great debt to all those artistes whose works have accompanied the most memorable moments of our lives. We hummed their songs, we fell in love, we laughed and cried and listened to their melodic voices at our parties. Now hearing them again reminds us of our recent and distant past, bitter and sweet, reminiscent of mother-love and our home. Elahe’s songs have also been covered by foreign artistes – most notably the song “Omide Zendegani”by Dinah Shore in 1966 and more recently by Pink Martini in 2013.